At the ripe old age of sixteen, I was promoted from behind the public bar to the relative elegance of the restaurant bar next door. My black tie was borrowed and my white shirt still boasted those sharp vertical creases from the packaging. I felt fairly refined. Pat, the manager, showed me the ropes to the accompaniment of James Last on the stereo. "In here, you just have to put on the bit of a show," he explained. He was gone before I could ask him what he meant. An elderly tartan-clad American gent sat up on one of my stools and ordered himself a 'Bloody Mary'. We served those out in the public bar now and again so I knew what to do. I got a small whiskey glass and fired a measure of Vodka into it. Then I added two economy-sized ice cubes and presented it to him alongside a little bottle of tomato juice which I had skilfully opened. Remembering about putting on the show, I wiped the bottle with a tea towel as I laid it in front of him. "What in the hell is this?" the American thundered as Pat the manager reappeared magically at my shoulder. Without a word he swept my version of a Bloody Mary from view and smoothly produced a gleaming cocktail shaker. He opened it, added vodka, juice, Worcestershire sauce, black pepper and just a hint of Tabasco. He sealed it all up and gave it a vigorous and theatrical shaking. 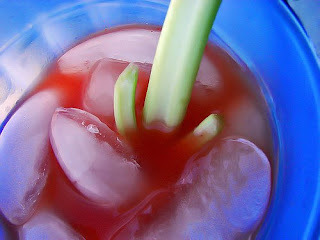 Then the cocktail was ready, beautifully presented in a tall slender glass and finished off with a stick of crisp celery. The manager's smile became a little more fixed when he turned back to me. "Remember," he hissed, "put on the show." It was a fairly quiet evening so I spent much of my time shining up glasses and watching all the beautiful people eat. I had a fine array of sparkling glassware in front of me by the time my next complicated order arrived. It came from a little bald man with a tweed jacket. "I'd like a 'Fifty-five' please." These days, most people know that a 'Fifty-five' is just lemonade and orange juice. You can even buy it in its own little bottle. But this was 1980 and I was at a complete loss. "What's in it?" I whispered. When he told me, I smiled. I knew what I had to do. I took the gleaming cocktail shaker and added an impressive scoop of ice. Then I opened an orange juice and a white lemonade and poured them equally in on top of the ice. The bald man in the tweed jacket looked a bit tense but I tipped him a reassuring wink as I sealed the top of my shaker down. I picked it up and shook it vigorously. It is a truism of bar work that lemonade is not well disposed towards being shaken. The top of my shaker exploded and took off across the restaurant, nearly decapitating the American with the Bloody Mary. A fizzy sticky mess of orange juice erupted all over my array of polished glasses and onward over the man's tweed jacket and bald head. The entire restaurant stared at me in disbelief, even James Last on the stereo seemed momentarily knocked off his stride. And all the patrons of the public bar were surprised to see me back so soon. "We thought you were trying out the posh bar tonight," they said. "I was," said I, "what can I get you, a pint?" Very funny, Ken. I just knew when you picked up that shaker, that something was going to go wrong. Reminds me of a Monty Python sketch, or more likely, a Basil Fawlty predicament. I loved how you said, Pat "magically appeared". Isn't that always the way? Ok... I fat fingered and put my comment on the wrong post. I also tended bar at a tender age. Trying to be sophisticated... what fun! Thanks for bringing back fun memories. Lol, great story. I worked in a bar in a family restaurant and we were taught bar flair as well, throwing bottles around etc - only a good idea with empty bottles. That cracked me up Ken, really you're still the raconteur. ha ha ha. This lightened up my otherwise gloomy morning. Thanks for sharing. And as a former bar maid myself, all I can say it that I'm glad I never had to make cocktails back then. Although I'm not too bad at it these days. Ken, I literally just spit coffee all over my keyboard.ROTFLMAO! I busted out laughing on this one. So hilarious, and you relayed it so beautifully. What can I say, Ken? I had to get my wife to explain the photograph to me. I can so laugh at this because I remember my move from cocktail waitress to behind the bar without being given training and making some mighty hilarious mistakes. I have 4 years of the restaurant working experience. All I could say is - this is simple awesome. Just goes to show a a person should stay with their root's. I laughed so hard with your story, I forgot all my troubles. It sounded like a scene from "Cocktail"
Very funny! I never worked in a bar, but I've waitressed. Apparently dropping a plate of spaghetti with the right amount of force will send sauce flying in every direction. It was a short career! Another great tale from the master. Very funny, especially that last image, the top of the shaker flying across the room, heading toward the American with the Bloody Mary. Perhaps it was best to be back at the public bar. I was actually quite a good barman, in my day... 'never a megastar with the old cocktails though. Fantastic story Ken, beautifully told, with no unnecessary show - the sign of a great story teller, knowing when to shake and when to stir! Hahahah Ken, that's hilarious. It's nice to see that all novice bartenders make the mistake of trying to shake something fizzy ;P Um.. that guy is so wrong: a Bloody Mary does NOT have anything but Vodka and Tomato juice in it. WTF? !